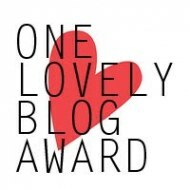 The fabulous hayleymade has nominated me for a One Lovely Blog Award, which is…well, lovely! Essentially, it’s a way to find out something about the person behind the blog as well as showcasing other blogs – like doing your bit for the blogging community, if you will. I’m a collector of crap. Currently avoiding destination bin are: a box of videos; some vintage Sindy clothes picked up from a charity shop; those pink plastic tokens you get from the 2p machines; toys from Christmas crackers; china (not the country); and er, bottletops. When making things, I don’t have fabric chalk, I always don’t pin stuff, uhm, basically, I start cutting and hope for the best. Sometimes, I don’t know exactly what I’m doing when I start either. My husband will usually peer over my shoulder and make a face until it resembles something normal. I’m addicted to those Lego games for the Wii. I’m talking 8 hours playing Harry Potter, after which I suffer with headaches and vivid dreams involving those pesky mini kits. I’m a bit of a film geek, especially when it comes to sci-fi and comedy. I even studied it at university. However, I have a penchant for terrible films, the badder the better. Currently tempted by this classic – Gymkata. I can quote Wayne’s World pretty much line for line and always find a Simpsons quote for any occasion. I once dressed up as Bender from Futurama for a fancy dress party. My lovely friend Cheryl over at The Cake Escape, maker of amazing and delicious cakes. I’ve recently discovered Pillows-a-la-Mode, which has some absolutely fabulous cushions as well as other crafts. bridgettbeau has a lot of awesome tutorials on retro crafting. Eileen at Touch Wood Design does really ace looking bags and cute vintage cushions. Arianna at Runway DIY takes catwalk looks and shows you how to make them yourself. Seriously cool. Let each person know you nominated them for the award! Posted in Uncategorized and tagged one lovely blog award. Bookmark the permalink.